Once you get an email saying your gallery page is ready, Log in to the site. 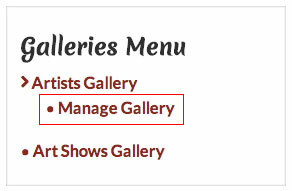 Click on the Galleries menu in the main navigation bar at the top of the page below the Omaha Artists Inc. logo. The submenu for Galleries will be on the right. Click on the Manage Gallery link. If you don't see this link you are not logged in or your gallery page has not been set up yet. You should see your gallery listed on the left, similar to the example below, with your name in place of ‘Your Name’ .